I was given a copy of One Great Year in exchange for an honest review. This post is part of the CBB tour for One Great Year. 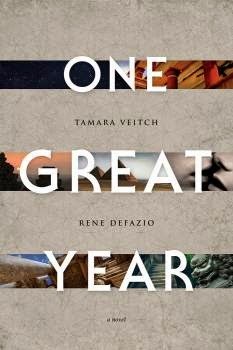 I was excited to read One Great Year because the themes of reincarnation, old-world religion, and a forced destiny appeals to me. I couldn’t wait to open the first pages and start reading. Read on to find out if One Great Year lived up to the back of the book! An epic, thought-provoking tale of reincarnation, love, and the struggle of good against evil. As the world descends from a Golden Age into darkness and brutality, Marcus has been reincarnated an exhausting number of times. Selected to become an Emissary, it is his duty to protect the ancient secrets. His adventure is heightened because he secretly consumes a serum that allows him to have memory from one lifetime to the next. In doing so, he sets himself up for thousands of years of torment, loneliness, and searching. Desperate to never forget his soulmate, Theron, and never sure if he was truly meant to be an Emissary, Marcus struggles through lifetimes to overcome his cruel and powerful nemesis, Helghul. Fusing the adventure of Indiana Jones with the introspection and wisdom of Eckhart Tolle, One Great Year takes readers on an epic journey through history, following characters who are born and reborn as they struggle to triumph over evil. From the synopsis, One Great Year sounds like it would be a sweeping epic about destiny, power, history, and long-lost love. The book opens with a glimpse into modern-day Marcus, but the book quickly travels back in time through the various reincarnations of Marcus. Through every story, he is searching for his one love that he had in the original life in Atitalans. I found the stories of the various lifetimes fascinating, but Marcus’ quest for the same woman each reincarnation felt a bit unrealistic. The book is quite long- over 400 pages of tiny text- and I’m not as into sweepingly long epics as I used to be. The book did seem to drag a bit in spots, which I am blaming on the length. The ending of the story felt a bit rushed. Most of the beginning of the story focused on Marcus and Theron, but at the end, the story switches prospective to Marcus’ rival, which felt a little odd and disconnected with the rest of the story. For the most part, the writing was solid. Occasionally, the slightly different writing styles of the two authors seemed to clash a little, and the writing kept the story from being quite as immersive as it could have been. My favorite part of the story was traveling along with Marcus through history. It almost felt like a grown-up version of Mr. Peabody and Sherman, or some of those old 1980s history cartoons where children are forced back in time to experience history in-person. All in all, One Great Year dives into a subject that few books ever touch, which was refreshing and interesting to read. The love story was touching and romantic, if a little unrealistic; and the characters were vivid and well thought-out. A few minor issues keep this book a few notches short of spectacular, but if you are interested in old-world religion, history, and reincarnation, then you will really enjoy reading this book. I do think this story will make a spectacular movie. What happens when two passionate writer-artists fall in love and decide to make an uncommon life together? 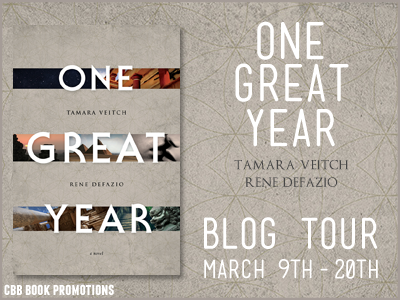 The award-winning novel One Great Year and its forthcoming sequels are just a few of the awesome possibilities! Born and raised in the Vancouver area, Rene DeFazio is an actor, screenwriter and producer with numerous film and television roles to his credit, as well as countless commercials and print ads. After spending many years backpacking and filming, Rene drew upon an abundance of unusual and exciting experiences to create One Great Year. His tireless research and firsthand knowledge of exotic locations, customs, sights and smells helped to bring this epic story to life. Tamara Veitch is a writer, artist and mother. She also grew up in the Vancouver area, and attended Simon Fraser University to study English and psychology. Tamara worked as a special education assistant for the Vancouver School Board, and later opened her own mural painting business. One Great Year took three painstaking years to complete. Within months of its independent release, One Great Year was optioned to become a Hollywood blockbuster film trilogy. Rene and Tamara have also partnered with Greenleaf Book Group for their literary debut and U.S. release, in October 2013. The authors are currently writing the second and third books in the One Great Year series, filming a documentary, embarking on a book tour, and offering free seminars called POD Parties (Plain ol’ Discussion about monumental topics), where they discuss the ancient history, modern science, and inspirations layered throughout One Great Year. Thank you so much for hosting a tour stop and reviewing the book!